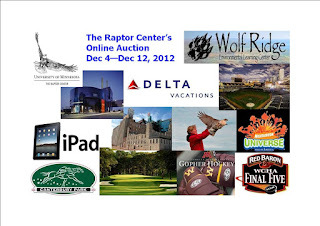 The Raptor Center: TRC's Online Auction is Live! TRC's online auction is now live! We have some wonderful packages for you to bid on this year. There are great opportunities for you to finally get together with those friends you keep meaning to, or a fun activity for your family to do. How about a date night to rediscover fun things about your sweetie? Click here to see all of the experiences and items we have this year. The bidding will go through December 12, and we can mail certificates/gift cards to make sure they reach you before the holiday.